WILMINGTON 68 • SHOPPING CENTER BUSINESS • September 2018 W ilmington, Delaware, may not be a place you think about ev- ery day. You have probably sent a credit card payment to Wilmington or passed through on the Amtrak from Phil- adelphia to Washington. And, if you work for a public company, chances are your company is incorporated here. 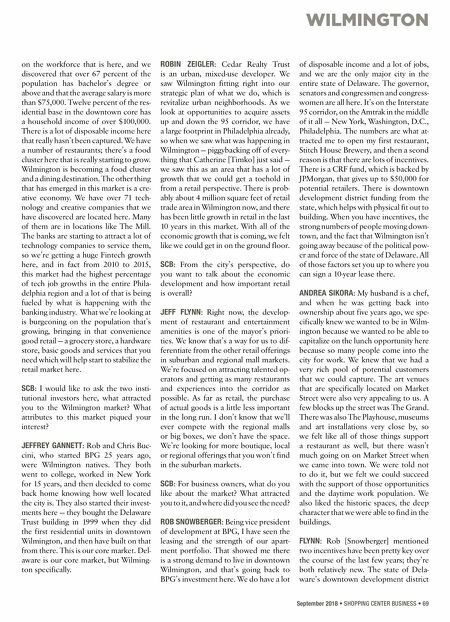 Banking and lawyering are the big businesses in Wilmington, creating the city's somewhat sleepy repuutation. Wilmington has a larg- er daytime population than in the eve- ning, with many office workers residing in other cities and towns. Wilmington's economic development leaders, and its development-minded mayor, Mike Purzy- cki, are looking to change retail by adding new businesses to the city's downtown. Cedar Realty Trust owns Christina Crossing, a 119,000-square-foot Shop Rite-anchored center at the south end of Market Street, the city's main downtown retail thoroughfare. Lining the central part of Market Street are historic build- ings with charm and character. National tenants include Walgreens and Starbucks, and local tenants dot the landscape in between. The city and local landlords like Buccini/Pollin Group are seeking retail, restaurants and entertainment for downtown. Shopping Center Business recently held a roundtable inside the historic DuPont Hotel in downtown Wilmington (as the building was under renovation to add retail and a food hall). In attendance were Jeffrey Gannett, director of investments, Buccini/Pollin Group; Robin Zeigler, chief operating officer of Cedar Realty Trust; Lars Kerstan, vice president of leasing for Cedar Realty Trust; Jeff Flynn, economic development director for the City of Wilmington; Michael Maggitti, deputy director, Downtown Visions; Andrea Laconti, owner of LaFia Bistro, Neal Dangello, vice president with Newmark Knight Frank, Rob Snowberger, owner of Stitch House Brewery and director of investments with Buccini/Pollin Group; Rob Herrera, found of co-working space The Mill; Tim McLaughlin, president, Wilmington Renaissance Corp.; and Catherine Timko, CEO of economic development advisory firm The Riddle Company. SCB : Can you give us a small overview of retail in Wilmington — how you are doing and how you attract here? TIM MCLAUGHLIN : Wilmington Renais- sance Corporation, and partners like Downtown Visions, have been work- ing with the city of Wilmington for 25 years. Our focus has been primarily on Market Street, the business corridor, and we recently took on initiative funded by JPMorgan Chase to do some analysis on the market and where we're at today with fresh eyes and a new lens in terms of the growth and development we have seen over the last decade to know what has been developed over the last few years and take a stab at what we think we should be looking at to bring into the market. CATHERINE TIMKO : We have been look- ing at all of the demographics and all of the development that has taken place. There is about $500 million worth of new development that is coming into the market, both in the core of downtown and on the riverfront including several new hotels; we've got an investment of about 2,000 residential units that are in the pipeline right now. The downtown population is just under 10,000 at this moment, and the daytime population is about 37,000, so your daytime pop- ulation is basically three times the res- idential population. It builds to a very robust market. We did some research Downtown Wilmington: The Secret Market With a strong daytime population and a growing regional population, Downtown Wilmington, Delaware, has efforts underway to attract new retail. Roundtable moderated by Randall Shearin (left to right) Rob Herrera, Tim McLaughlin, Andrea Laconti and Rob Snowberger.